Turnip Curry & Coconut Chutney – Dig Delve – An online magazine about gardens, landscape, growing & making. Seldom has anyone said, “I really fancy a turnip for dinner.” Along with their cousin the swede, turnips suffer from a longstanding reputation as being good only for animal fodder or the poverty-stricken. The first reference to turnips (Brassica rapa ssp. rapa) is in John Gerard’s Herball, or Generall Historie of Plantes (1597), where he writes, “It groweth in fields and diverse vineyards, or hoppe-gardens in most places in England. The bulbous or knobbed rotte, which is properly called rapum or turnip, and hath given the name to the plant, is many times eaten raw by the poor people, but most commonly boiled.” Over two hundred years later little appears to have changed when John Rogers states in The Vegetable Cultivator (1839), “That turnips are nourishing has been proved. In Wales, a few years since, they formed a considerable portion of the food of the lower classes’. Even those doyennes of middle class Victorian cuisine, Eliza Acton and Mrs. Beeton, can suggest little more to do with turnips than boiling or mashing them. The most complicated treatment from both requires only a dressing of white cream sauce on the boiled roots. This addition of dairy produce in the form of milk, butter or cream provides the contrast to their slight bitterness – common to all brassicas – and which I imagine made them more acceptable to palates unatuned to this flavour. In oriental cooking, where bitter flavours are more highly prized, turnips are simply steamed or braised and cleanly flavoured with soy, mirin and fresh ginger. It is more common for them to be used raw as brined pickles or as a grated accompaniment, in the same manner as daikon, and they can replace these large radishes in all recipes that call for them, although their flavour is not as strong. There are now a number of varieties available to grow, from the traditional purple top types through more decorative red and orange skinned varieties to the small, sweet, snow white cultivars from Japan. We rely on the commonly available ‘Purple Top Milan’, and successional sowing throughout the year from April to August provides us with a steady supply from late spring to early winter. Being fast growing and water lovers turnips do best in moisture retentive soil which has been enriched with manure for the previous crop. Early sowings are very prone to attack from flea beetle, which can decimate the young foliage, so these we protect with a layer of fleece or Enviromesh until the seedlings are large enough to fend for themselves. 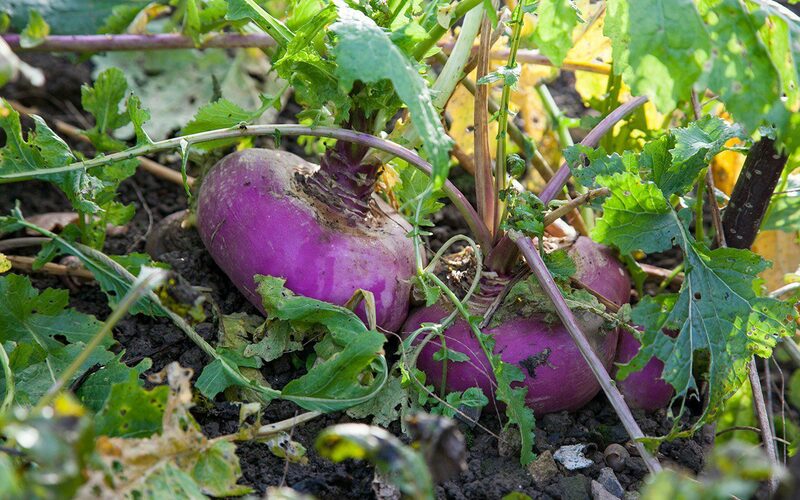 With a higher water content than swedes, turnips do not respond well to frost, so they should be lifted now and stored in sand or dry compost in a cool, dark shed for winter stores. This recipe came from a desire to do something with our turnips that would give them the lead role in a main dish that would challenge people’s opinion – ours included – of this vegetable as a nothing more than a supporting player. 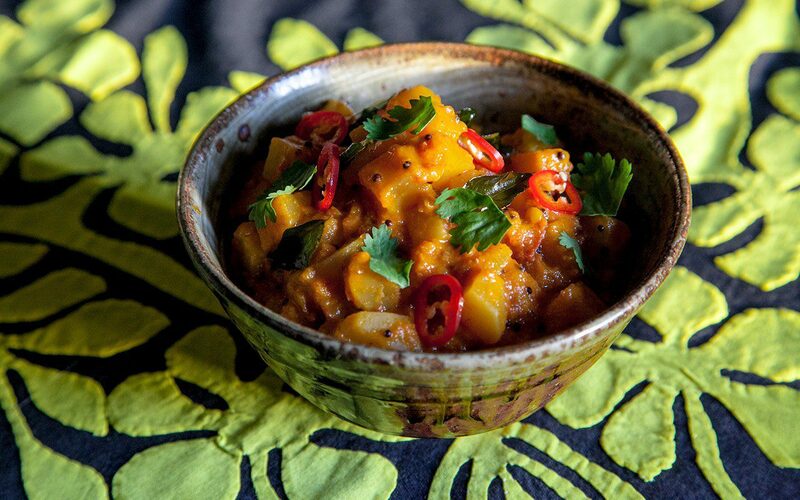 With the current nip in the air as winter’s grip gets hold we are also increasingly drawn to spiced food, and a fresh curry is a great way to warm up after a day in the garden. Ample use of mustard seeds keep things in the brassica family, while coconut milk provides the contrasting equivalent of dairy. Unsurprisingly this recipe works just as well with swede, or any of the more commonly available root vegetables such as beetroot, parsnip and celeriac, although you may want to adjust the seasoning to counteract the sweetness of these last three with the addition of some lemon or lime juice just before serving. 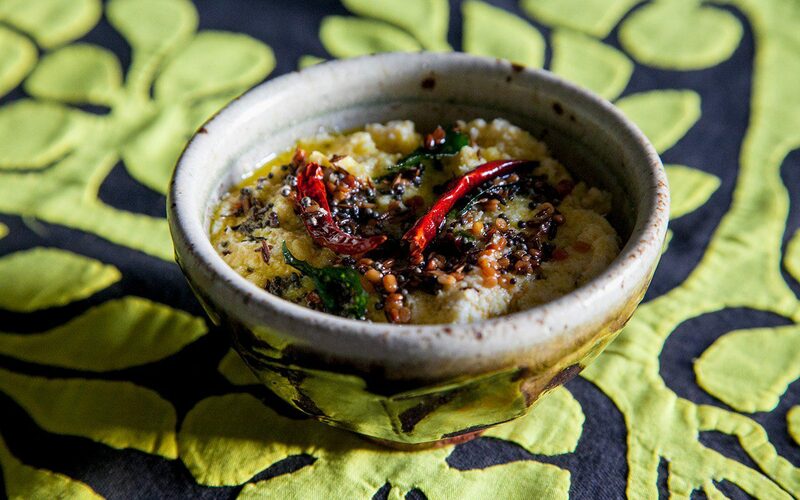 The coconut chutney is by no means essential, but the extra effort involved is minimal and helps turn this humble vegetable into a memorable main meal. To make the curry first put the onion, garlic, ginger, chillies and coriander stalks into a small liquidiser (a Nutribullet type is ideal for this). Process into a paste. Scrape the sides of the bowl down several times to ensure a smooth consistency. Heat the oil in a pan large enough to take all of the ingredients. When smoking add the mustard seeds and curry leaves and cook until the seeds begin to pop and the leaves are translucent. Add the onion puree and cook over a high heat, stirring continuously, until the mixture has given up most of its water and is starting to become golden. About 5 minutes. Add the ground dried spices and the bay leaves and cook for another minute until fragrant. Add the tomato and stir well. Cook for another 3 minutes, stirring frequently. Add the turnip to the pan. Stir well to coat all the pieces. Bring to the boil then turn the heat to low and simmer until tender. This will take about 20-25 minutes, but will be less for young turnips and maybe more for older ones. The turnips create quite a bit of liquid, but stir from time to time to ensure that it doesn’t catch. Add the lentils and stir to incorporate. Continue to cook on a low heat for 15 minutes until the lentils soften. Add the coconut milk and turn the heat back up to high. Boil until the lentils have disappeared into the sauce, and then reduce until there is enough to just coat the turnips. Season with salt. Keep warm. While the curry is cooking make the coconut chutney. Heat one tablespoon of oil in a small frying pan. When smoking put in the chana dal and fry for a couple of minutes until toasted and dark orange in colour. Put the chana dal, coconut, green chilli and ginger into a small liquidiser and process until smooth. You may need to loosen the mixture with a few tablespoons of water or, if you have some coconut milk left from a 400ml can opened for the curry, some of that. Season with salt to taste. To make the temper heat the remaining tablespoon of oil in the same small frying pan in which you cooked the chana dal. Add the urid dal and fry for a minute or two until golden, then add the remaining ingredients. Continue to cook until fragrant and the mustard seeds start to pop. Mix half of the temper into the chutney. Transfer this to a serving bowl and then pour the remaining temper on top. Put the hot curry into a warmed serving dish. Garnish with a few fried curry leaves, some rings of finely sliced red chilli and a scattering of torn coriander leaves. Serve with boiled rice or sponge dosa. This also makes a very good filling for a crisp masala dosa.